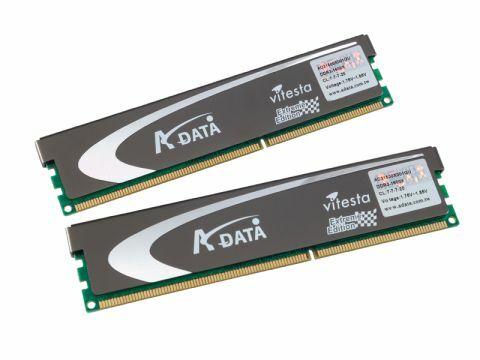 A-Data has really upped the ante with the packaging for its Vitesta Extreme Edition memory - if nothing else. The sticks themselves sit in a pair of foam boxes resembling luxurious coffins. If Dracula was in the habit of choosing RAM, he'd certainly go for this based on packaging alone. But does it have any bite? Performance is fairly decent - not quite up there with OCZ's DDR3-1,600 memory, which is of the same specification but with a slightly higher maximum bandwidth. Where A-Data's memory shines, however, is in the overclocking stakes. It's got potential for increasing the voltage, and the 1,600MHz clock can easily be pushed to 1,772MHz, resulting in a noticeable performance increase. It's also worth considering if you're going to be getting a P45 motherboard - the 1,600MHz clock will be accessible on these without any overclocking, and it's aesthetically minimalist without losing any cooling. However, if you aren't planning on overclocking it's worth sticking with OCZ's slightly better offering. Unless of course you really fancy stroking that luxurious packaging.